For any solider, one of their most important weapons to maintain is their personal hearing. Hearing never sleeps — it keeps us aware every second of every day. It keeps the solider alert to environmental dangers, in contact and communicating with fellow soldiers, and connected with their families at home. Yet, it is one of the most sacrificed senses in active combat. The U.S. Department of Veterans Affairs (VA) reports that auditory disability is the most common disability produced by the War on Terrorism. Many of those soldiers are returning from combat in Iraq and Afghanistan with permanent hearing loss and tinnitus. More than 78,000 veterans are on disability for hearing loss, many due to the explosions of powerful roadside bombs and weapons fire, according to the VA. This hearing loss has a significant impact on the quality of life and long-term mission readiness of all soldiers. Exposure to high noise levels has long been recognized as an issue for the military. The two types of noise, high steady (continuous) noise generated by vehicles or aircraft and high impulse noise generated by weapons or explosions are both damaging but in different ways. Soldiers who are exposed to these types of noise without adequate protection will suffer either temporary or permanent damage. Noise-induced hearing loss (NIHL) accumulates over time, its effects realized long after the damage has been done. NIHL is permanent and irreversible. Acoustic trauma can cause hearing loss with one exposure event. Though many in the armed services consider hearing loss as a “price to pay” for their years of military service, it is ultimately an illness that could limit their ability to accomplish assigned mission tasks, prevent their participation in combat and other field activities, potentially lead to a medical reclassification or discharge from service all of which ultimately effects unit readiness. Efforts within all branches of the armed forces, however, are taking hearing protection more seriously not only as a health issue, but certainly more immediately as a mission readiness issue. The services are taking a more holistic and preventive approach towards hearing conservation. On a regular basis, soldiers are provided an audiometric evaluation and other diagnostic services to determine their hearing capability and their ultimate mission readiness prior to deployment. Soldiers with H1 or H2 status (hearing thresholds within 30 dB at 500, 1000 and 2000 Hz, or not more than 30 dB, with no individual level greater than 35 dB at these frequencies, and level not more than 55 dB at 4000 Hz; or audiometer level 30 dB at 500 Hz, 25 dB at 1000 and 2000 Hz, and 35 dB at 4000 Hz in better ear) are approved for deployment; those with H3 or H4 and sustain hearing thresholds beyond are non-deployable and may be restricted in their full duties. On base, the clinical hearing offices provide diagnostic and prevention services. These preventive services include hearing loss intervention, fitness for duty evaluation, speech recognition in noise testing, monitoring hearing thresholds to prevent further hearing loss, and, in the worst case scenario, dispensing hearing aids to those who have sustained a permanent injury. Forward deployed uniformed audiologists manage soldiers identified with hearing loss. The path to a successful hearing program requires soldiers who are motivated to prevent noise-induced hearing loss. It is ultimately the responsibility of each soldier to protect themselves from hazardous noise. Similar to more traditional occupational hearing conservation programs, the Hearing Conservation requirement mandates that soldiers receive regular training on several elements: noise hazard identification; engineering controls; hearing protectors; monitoring audiometry; health education; enforcement; and program evaluation. Though hearing conservation training has traditionally been held in a classroom format, some training has been held in a variety of settings and context, including training on-the-range, in-combat, and in civilian or at-home settings. Each of these training sessions reinforces relevant hearing conservation messages in a more real-world setting, and better engages each soldier’s connection between healthy hearing and mission readiness. Through the integration of new hearing protection and communication technologies, Tactical Communication and Protection Systems (TCAPS) enable soldiers to communicate in combat scenarios without compromising their hearing ability. TCAPS merge electronic hearing protection with the ability to hear ambient environmental sound and two-way radio communications systems. Most TCAPS incorporate advanced hearing protection technologies such as Active Noise Reduction (ANR) for continuous noise hazards, adaptive protection from impact or impulse noise, increased hearing, and transmission of speech communications through either external boom microphones or internal in-ear voice transmission. TCAPS are available as headband earmuffs and in-ear models that fit like an earplug and can accommodate helmets and other protective headgear. TCAPS have gained greater acceptance and use by soldiers in all branches of the armed forces. While many had perceived TCAPS as an expensive niche device, soldiers are now realizing that they are an essential part of their equipment and combat systems. By providing “bionic” hearing and adaptive hearing protection in all noise environments, TCAPS enable soldiers to have a fuller sense of situational awareness – which can be the difference between life and death in combat. Today’s fluid mobile battlefield requires soldiers to quickly transition between mounted and dismounted roles efficiently, without having to adjust or reconfigure their communications equipment. 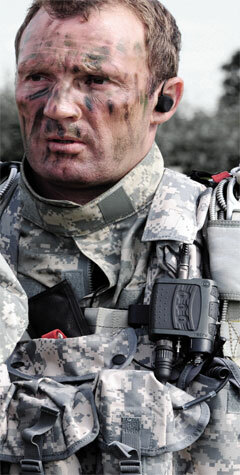 Within the TCAPS program, the technology exists to intelligently and intuitively protect while still connecting soldiers in high noise in both mounted and dismounted scenarios, solving the problem of providing total hearing protection, while maintaining situational awareness and communication in all combat environments. QUIETPRO®, from Honeywell, is the only tactical in-ear intelligent hearing protection and communication system that provides automatic hearing protection throughout the full spectrum of deployed operations: from the moment the soldiers leave the operating base to their return. Hearing protection is ensured while the user is inserted or extracted on a range of mobility platforms. QUIETPRO should not be considered as “just another headset” connected to a radio. Rather, it is an intelligent hearing system that continually adjusts its performance to the conditions that the soldier is subjected to in all aspects of training and combat operations. With automatic hearing protection that, once fit, requires no user intervention, no buttons to press or dials to turn, the soldier is able to focus on the important aspects and objectives of the mission. QUIETPRO’s smart technology seamlessly reproduces sound, naturally and clearly, without affecting high noise attenuation. It does so automatically, using ultra-fast digital processing, providing proper protection against continuous, intermittent and impact noise without user intervention through digital Active Noise Reduction (ANR) and an adaptive digital signal processor. In communication, voice is transmitted through the ear canal instead of an external boom microphone eliminating the pick-up of ambient combat sounds which could compromise clear communication. The ability to discern the difference between “attack” and “get back” will define success on the battlefield. Since entering into operational service in 2005, more than 63,000 QUIETPRO units have been fielded across 13 countries. More than 40,000 are in daily service with the U.S. Army, U.S. Marine Corps, U.S. Air Force and U.S. Government agencies, and is the only in-ear intelligent hearing protection and communication system approved for the U.S. Army Nett Warrior soldier modernization program. As with any hearing protector, it is integral to the soldier’s success that they are properly trained and competent in the use of any TCAPS, such as QUIETPRO prior to deployment. Just as with any weapon, one cannot expect a soldier to effectively use a piece of technical equipment handed to them in combat; training is crucial to success. Each soldier should be proficient in the proper installation of the eartip in their ear canal in order to achieve a proper fit and competent in fully utilizing its sound management features. Without achieving these basic skills, the TCAPS will not live up to its potential, especially in combat. 2. Nakashima, Ann and Sharon M. Abel. “Effects of Integrated Hearing Protection Headsets on the Quality of Radio Communications.” Defence Research and Development Canada, July 2009. 3. Moore, Jack Capt. “TCAPS Prepares to Protect and Serve.” Solider Modernization, June 2009.